You're not alone if the thought of hunching over a bowl of hot noodle soup, the broth steaming up your glasses while shovelling noodles into your mouth, makes you actually and longingly dewy-eyed for the cold weather. Looking for noodle-soup inspiration? Here's our top 12 places get your slurp on. Don't be afraid. 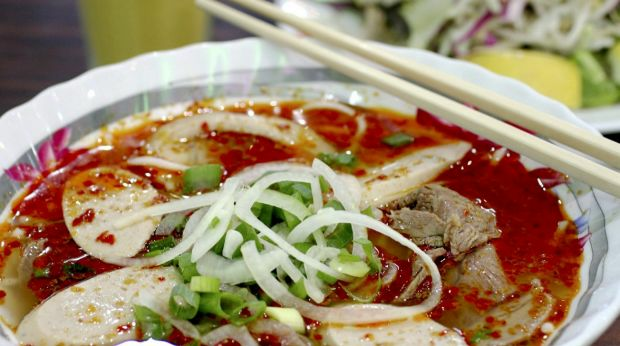 The slick of chilli oil in each bowl of bun bo hue isn't half as spicy as you think. This spicy beef noodle soup – originally from central Vietnam – is a specialty here. Thick ropes of rice noodles swim among shaved slices of beef, hunks of pork and peppery pork loaf. Add extra lemongrass chilli paste from the table condiments tray. Skip the pigs blood if you prefer. A back-lit photo menu offers more than 50 noodle soup options, each customisable with your preference for thin egg noodles, fresh rice noodles, dried rice noodles or flat egg noodles. Seafood wonton noodle soup is reviving and the king prawn laksa is richly satisfying but we love No. 1, a Cambodian combination noodle soup with prawn, beef mince, pork liver, blood jelly and pork intestines in a clear chicken broth. The soba noodles here are made fresh every day by hand with freshly milled Tasmanian organic buckwheat. Time your visit right and you can watch the noodle master in the front window. Savour the toothsomeness of fresh soba with juicy slices of duck and mushroom in a dried bonito and soy-based soup or try the walnut soba noodles in a nutty sesame and walnut soup. Vegetarian soup bases are available. Ten types of ramen await at Manpuku, Japanese for "all health and happiness". Broths are based on chicken or pork and you can choose from three types of noodle. Order the salt-based chicken soup for something lighter or go full throttle with the collagen-rich pork tonkotsu. The soy-based pork and chicken soy (No. 7) is a treat too. Traditional conical bowls should keep your soup hot until the last drop. Mie kocok means "shaken noodles" in Indonesian, a specialty of Bandung city in West Java. Springy egg noodles arrive in a light beef soup with all kinds of beef bits including a giant meatball stuffed with a quail egg – like an Indonesian scotch egg. Order the yamien for crinkly noodles topped with beef mince. Soup on the side can be sipped separately or poured onto the noodles as you please. 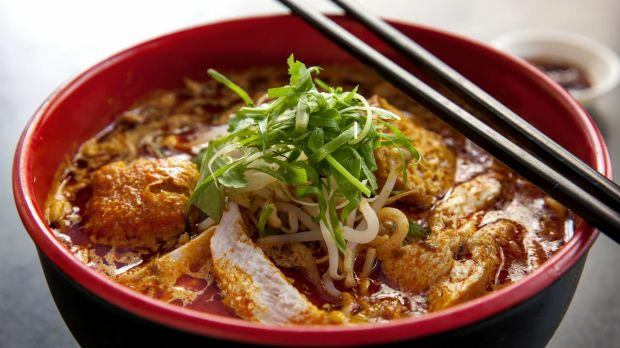 The spicy richness of one of Sydney's best laksas is guaranteed to warm you up from the inside. Thin vermicelli noodles and bobbing puffs of deep fried tofu soak up this fragrant coconut milk soup, customised with your choice of chicken, beef, vegetables, tofu, prawn or mixed seafood. Prefer something lighter? The har mee special on Tuesdays, Fridays and Saturdays yields two kinds of noodles in an intense prawn broth. Sure you could order the hot and sour tom yum noodle soup but you'll notice the Thais around you tucking into bargain bowls of $4 boat noodle soup. 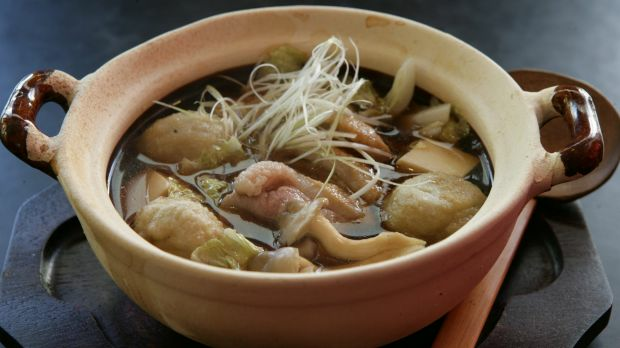 This fragrant herbal soup is thickened with pigs blood and dotted with nuggets of crackling. You pick between pork and beef balls. Yen ta fo is another favourite, rice noodles and a bounty of seafood tinted pale pink from fermented soybean paste. Crossing-the-bridge noodles is a classic Yunnan dish, a chicken, pork and duck-based soup served in a clay pot for maximum heat retention. The kitchen can serve it ready-to-eat but it's much more fun to do it the traditional way and cook it yourself. That means a parade of plates holding meat, vegetables, egg and noodles that you add in a specific order. Staff will provide a crash course in instructions. Mohinga is Burma's version of pho, most popular at breakfast but readily eaten any time of day. This hearty fish soup is known for its balance of sweet, sour and salty; we're talking ginger, lemongrass, tamarind, shrimp paste and turmeric. Dig past the mound of split chickpeas, hard-boiled egg and fresh coriander and you'll find a tangle of rice vermicelli noodles. Shards of deep fried crackers provide a welcome crunch. 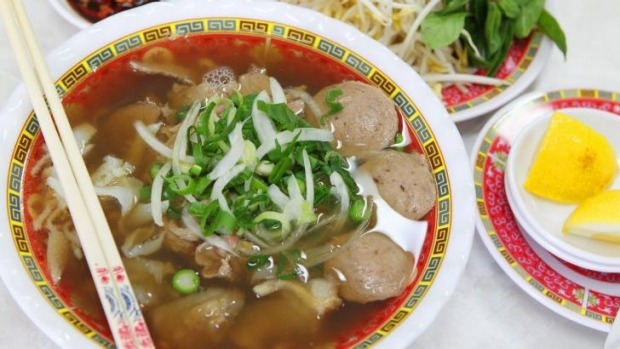 Slurp as loud as you like at this Cabramatta institution, ladling out restorative bowls of pho for more than 35 years. The clear beef broth has a deep intensity, rounded out by the sweetness of aromatic spices. 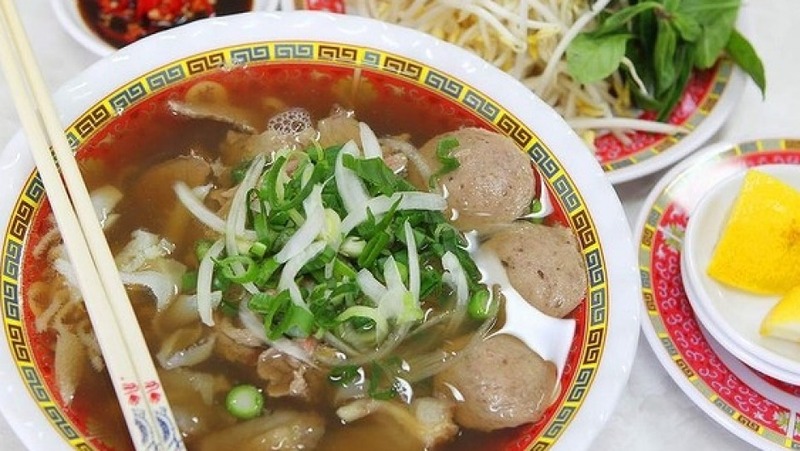 Seven types of pho include chicken, beef and seafood. Also try hu tieu, tumble of bouncy tapioca noodles in a clear pork and fried red shallot soup draped with either seafood or chicken. 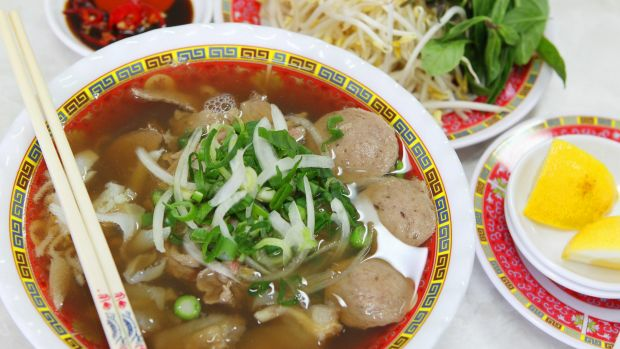 Get slurping at Pho Tau Bay, Cabramatta. Photo: Wesley Lonergan. This narrow 20-seater in Strathfield's Korea Town is always busy, known for its handmade dumplings (mandoo) and noodles. Cosy up with the beef bone noodle soup, tinted milky white after boiling beef bones at high heat, or succumb to the spicy seafood noodle soup, jam-packed with prawns, mussels, squid and crab. Both come with kalguksu, handmade knife-cut wheat flour noodles that are pleasurably chewy. Complimentary kimchi is a hospitable bonus. Choose your own adventure at this self-serve station for malatang, a Sichuan-style hot and numbing soup charged by weight. Choices include bean curd sheets, bamboo shoots, lotus roots, leafy greens, exotic mushrooms and a dazzling assortment of fish cakes. Pick your noodles and ask for raw beef or housemade Harbin sausage at the counter. After cooking they'll add seasonings – accept them all but get the chilli sauce on the side.